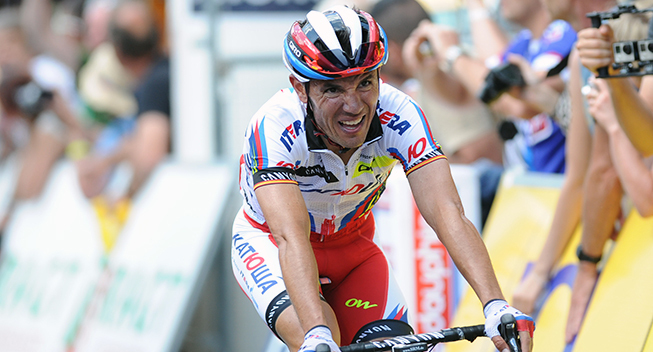 Joaquim Rodriguez (Katusha) confirmed that he is back to his best for the Tour de France when he took his second ever victory on the Mur de Huy with one of his trademark sprints. With a powerful acceleration, he distanced his rivals and held off a fast finishing Chris Froome (Sky) who nearly closed the gap. The Brit took over the leader’s jersey with a tiny one-second advantage over Tony Martin (Etixx-QuickStep) who missed out on the lead again. Since he crashed in last year’s Ardennes classics, Joaquim Rodriguez has been through a testing time where he has unable to live up to his past performances. However, he has always claimed that he was back in form for the Tour de France and today he confirmed that assessment when he won the stage to the Mur de Huy three years after he had won the Fleche Wallonne on the same climb. Things didn’t look good for Rodriguez yesterday when he crashed in the finale and lost time in the crosswinds. That made him uncertain about what to expect in today’s stage which was one of his big goals in the race as he suffered from an injured knee. However, nothing was wrong with the Spaniard when it came down to the uphill battle on the Mur. With one of his trademark accelerations, he distanced the race and even though Chris Froome finished extremely strongly, he held the Brit off to take the victory. The race had been a controversial one as a big crash with 60km to go had involved riders like Fabian Cancellara (Trek) and Tom Dumoulin (Giant-Alpecin). While the former managed to complete the stage – albeit in a lot of pain, the latter withdrew and missed out on the chance to take the yellow jersey. The commissaires chose to neutralize the race for a while to allow the medical staff to attend the many injured riders and it took a long time for the race to be resumed. When that happened, they rolled up the first climb of the day Cote de Bohisseau before the racing got serious with 43km to go when Cannondale-Garmin hit the front with Sebastian Langeveld. The riders approached a crosswind section and so the big team quickly hit the front to make sure that their leaders were protected. However, Tinkoff-Saxo won the battle and it was Daniele Bennati who attacked hard. A small group with several Tinkoff-Saxo and Astana riders got clear and the latter tried to keep the break alive with Rein Taaramae and Andriy Grivko. However, Sky managed to bring a group with around 45 riders back to the front and so a 50-rider group gathered on the front. Thibaut Pinot (FDJ), Romain Bardet (Ag2r), Rui Costa (Lampre-Merida), Cancellara and Alejandro Valverde (Movistar) were among the riders to have missed the split and so Lampre-Merida and FDJ started to chase hard. As they hit a small climb, Valverde Pinot, Bardet and a BMC rider managed to bridge the gap while Lampre-Merida continued to chase. Cofidis were now preparing for the intermediate sprint with Geoffrey Soupe and Julien Simon setting Nacer Bouhanni up. However, it was André Greipel who came out on top, holding off John Degenkolb, Bouahnni, Bryan Coquard, Mark Cavendish and Peter Sagan. The riders were now in a less exposed section and so Orica-GreenEDGE managed to bring the groups back together. Astana and Tinkoff-Saxo continued to set the pace with Ivan Basso and Matteo Tosatto but the fight for position was still very intense as they approached the hilly finale. Cannondale hit the front with Jack Bauer as riders now started to get dropped. Cancellara finally had to surrender while Etixx-QuickStep hit the front as they approached the Cote d’Ereffe. Michal Kwiatkowski set the pace while most of the sprinters got dropped. Angelo Tulik (Europcar) launched an attack but he was quickly brought back when Nathan Haas (Cannondale) was passed by the Sky train after he had taken a turn. Tinkoff-Saxo wanted to make the race hard and so Michael Rogers hit the front. Rafal Majka quickly took over and he made the peloton explode to pieces, with Mathias Frank (IAM), Costa and Pinot being among the riders to lose contact. Julian Arredondo (Trek) sprinted ahead to win the KOM sprint before they started the tricky descent. Here Majka and Roman Kreuziger missed a turn and while the latter went down, it prompted Froome to hit the front to stay safe. Geraint Thomas took over as they hit the flat roads where the fight for position started. Meanwhile, Pinot was desperately chasing 10 seconds behind. Bob Jungels got a small gap just before they hit the Mur de Huy but he was quickly brought back by Majka. Meanwhile, Kwiatkowski was among the first riders to get dropped as the peloton exploded. Giampaolo Caruso (Katusha) set a brutal pace for his teammate Rodirguez and when he swung off, Froome took over. The Brit sent several rider out the back door before Rodriguez made his acceleration in the steepest section. Only Tony Gallopin (Lotto Soudal) and Froome could keep up with him but when the former cracked, he got a gap. Froome reacted too slowly and had to work hard to rejoin the Spaniard. He got close but in the end had to settle for second while Alexis Vuillermoz (Ag2r) did a great comeback to take third. Nairo Quintana (Movistar) and Vincenzo Nibali (Astana) both lost 11 seconds while Alberto Contador (Tinkoff-Saxo) was a few seconds further back. However, the big loser was Pinot who crossed the line with a time loss of more than 1.30. Tony Martin did his best to limit his losses but it was another heartbreaking near-miss for the German. With the time bonus and his gains, Froome takes the lead with a 1-second advantage over Martin. However, Martin will get another chance to take yellow tomorrow when the riders will tackle the feared stage over the Paris-Roubaix cobbles. After an early sector at the midpoint, the riders will tackle no less than 6 paves inside the final 60km, with the final one coming just 13km from the finish in Cambrai. After yesterday’s windy drama, stage 3 was expected to bring more action as it was like a mini Fleche Wallonne. It brought the riders over 159.5km from Antwerp to a finish on the Mur de Huy and after a flat start, it included four climbs. The first one came 50km from the finish while the riders tackled another two ascents inside the final 20km before they got to the brutally steep Mur that led to the finish and included sections of more than 20%. It was a sunny day in Belgium when the riders took the start and rolled through the 13.3km neutral zone. As soon as the flag was dropped, Jan Barta (Bora-Argon 18), Martin Elmiger (IAM), Serge Pauwels (MTN-Qhubeka) and Bryan Nauleau (Europcar) attacked and they were immediately allowed to get an advantage. After 10km of racing, the gap had gone out to 1.20 and this was the signal for Trek to take control. While Stijn Devolder and Markel Irizar set the pace, the gap slowly increased but it was already a very nervous peloton as Sky, Tinkoff-Saxo, Movistar, Katusha and Astana lined out their trains next to the Trek riders. With 100km to go, the gap started to come down as it dropped to less than 3 minutes. However, the real acceleration came with 80km to go when they approached the feed zone. The nervous peloton made the gap melt away and with 70km to go, it was just 1.10. The Trek riders disappeared from the front and instead BMC, Katusha, Sky, Tinkoff, Astana and Movistar were lined out on the front. The gap stayed around 30 seconds who a little while and the escapees fought hard to keep the peloton at bay. Meanwhile, Tony Gallopin (Lotto Soudal) worked hard to rejoin the peloton after a puncture. That may have been a blessing in disguise as he was behind when William Bonnet (FDJ) hit another rider on a descent, causing the big crash that created chaos and prompted the commissaires to neutralize the race.